I think this quote makes a good discussion piece. I see it as meaning that it is better to go through difficult times with a friend – or friends – than through easy times alone and friendless. Friendlessness can so often mean loneliness – not something many people would willingly choose. Good friends will be there for each other, even when life gets tough or sadness strikes. Post three different quotes on consecutive days. They can be from any source, or your own. All three quotes can be of a similar theme (as I have chosen Friendship) or can all be completely different/unrelated. Now this is a discussion piece, if ever I heard one. But I’ll leave you to ponder on it. Now I can’t stop thinking about that Confucius quote! What is your interpretation of this quote, Snowsomewhere and may I ask, why did it garner your attention? Thanks for asking! I guess why I keep playing it in my head is because I’m not 100% sure if I agree. I know the noble answer would be yes, that’s true, but to be honest, most people probably aren’t that selfless. Or maybe it’s just me! 🙂 I think the point is, that you should just try to be open and positive in all situations and you’ll end up being the winner. What about you? I was completely befuddled at first. But I did think about it for some time and then I could see another angle that perhaps he was getting at. I think he emphasizes that a susicious nature is bad news for everyone. Better to make a mistake and learn than from it than be suspicious of many? Does that make sense? Yes, that does make sense. I think it might be about having a “pure heart”, to put it poetically 🙂 Which is actually what you’re saying. An interesting expression. I had not thought of a pure heart being used in this context but I think you are most definitely right! What a great quote, I’d never heart that one — thanks for sharing! I haven’t even gotten to either editing or flash fiction, because I’m still neck-deep in catching up on real life! Thanks Millie for the lovely link back to my blog, ‘Something to Ponder About’ – where you will indeed find Proverbial Thursday. (My username is Forestwoodfolkart) I have been away on holidays so there has been no Proverbial Thursday this week, unfortunately. But I am glad you have taken up the baton in my absence. I love the pun you made about Confucius confusing us, as he surely does with this quote. But when you ponder it a while it is a little clearer. I do think trust is a huge part of friendship and most of ushas an inbuilt desire to want others to be ‘good’ and do the right thing by us. A failure to trust others is, according to Confucius, shameful. He is warning us to avoid becoming a suspicious, perhas even gossip mongering person who brings trouble to a community. Of course blind trust in every single stranger is unrealistic and many of us have an inbuilt radar that protects us from foolish trust in strangers. Within a frienship though, much is to be learned by each person through, and following an act of deception, albeit painful. Am I making sense here, Millie? You are making perfect sense, Amanda, and I do agree with what you have explained. I know I commented on the proverb at the time. It’s a very thought-provoking one, and one that certainly makes a good discussion piece. I’ve no idea where I heard that pun before. It’s one I’ve known for years and it just came to mind when I was talking to Snowsomewhere yesterday. 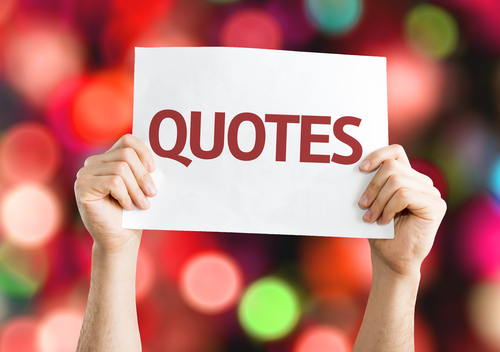 And there are more thought-provoking quotes to come in the Confucian series. 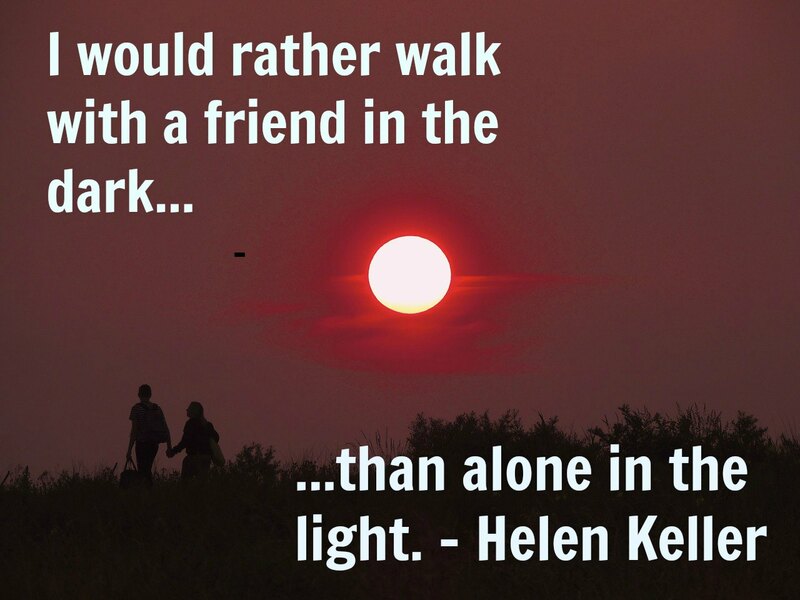 I also would like to point out the wisdom in the Helen Keller quote.I agree it can refer to the difficult times and the benefits of friends to help one through. Goodness knows I needed my girlfriends and a strong cuppa at many times of crisis. However, for Helen the darkness was her world and she struggled to make sense of it, but how she blossomed when she gained a teacher, and friend. Friends give our life meaning and almost everyone who is without a friend would feel lonely. Loneliness can be desperate, sad, debilitating and may affect individuals in every life stage. In a cruel experiment in the fifties, animals and very young children were deprived of their paternal affection and after only three months withdrew into a comatose like state completely withdrawn from reality. Similarly, lack of a friend/loneliness can be likened to a loss of interest, affection and attention from others. Underneath it all, we humans need some degree of attention lest we also like the babies in that experiment wither and die.I am so glad Helen Keller found her friend and was spared a life of loneliness. To her, friendship was more important than light. I love the quotes and the one by Confucius is really worth reflecting on. It also makes me think of how our thoughts can affect the relationship we have with others. A mind already suspicious of someone will consistently see the faults it’s searching for and set the other person on edge. You’re welcome, thanks for sharing it with us. The touch,the smell,the aura of everything around her could touch her soul.Wasn’t it magnificent ? She was a marvellous woman and had honed her other senses so well.